I remember my parents taking myself and my siblings to a frozen yogurt place called Yozen Frogurt. I thought the name was terribly clever at the time. 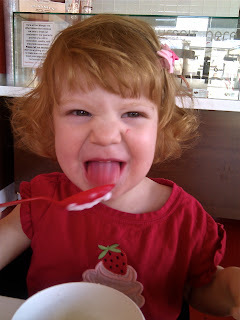 Frozen yogurt seemed like a really special treat. My favorite flavor then and now? Chocolate with gummy bears. Am I crazy or is frozen yogurt majorly back in? I've seen frozen yogurt places popping up everywhere. 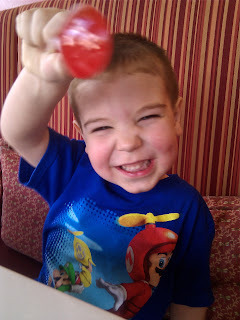 Because I love, love it, I made it a habit to treat my kids every once in a while. 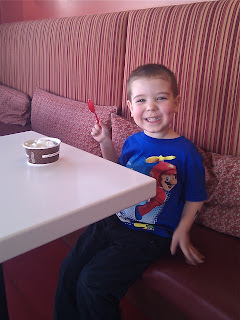 When I discovered Red Mango, I started treating myself and my kids a little more often. It's all natural, so I can justify eating it for lunch. It's delicious. I think I've become an addict. I don't get chocolate with gummy bears, but I do get the mixed berry parfait. My little ones like the original flavor with berries and mochi. We have a good time of it as you can see. I suggest stepping out and treating yourself (and your little ones) to your favorite fro yo. *This is NOT a paid advertisement. What fun - for your kids AND you! 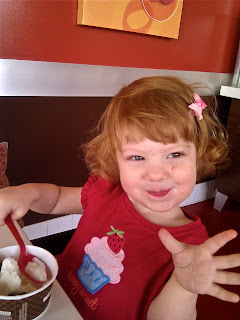 We have a custard place just walking distance from our house, and I love taking my toddler there on warm summer days for custard or the occasional berry cobbler. Yum yum!